First off I’d just like to say thank you to Director, Gabriel Olson for allowing me access to an online screener of his 12 minute, Suspense/Thriller short “The Bridge Partner”. 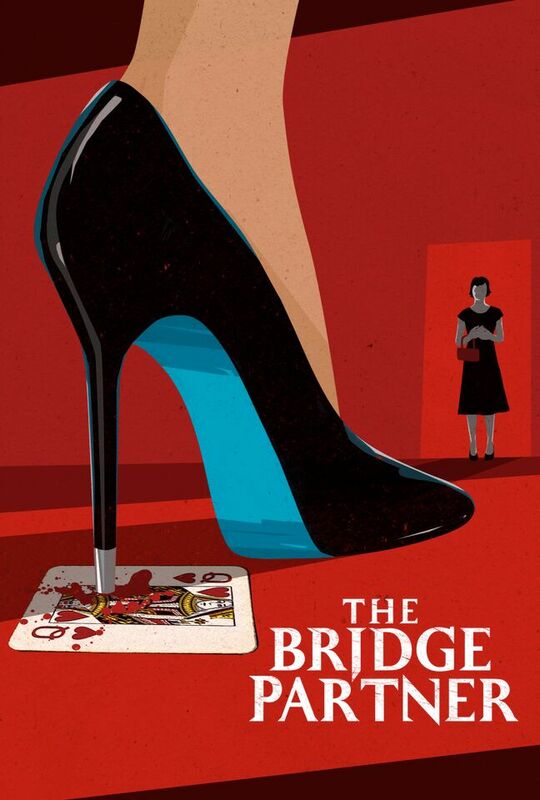 The Bridge Partner is about timid housewife Mattie Whalen (Beth Grant), who believes she hears her new bridge partner Olivia (Sharon Lawrence) threaten to kill her. Will it be a fight for survival or is it just her sanity that’s in question? The film also stars Catherine Carlen and Robert Forster. I was lucky enough to have Gabriel stumble upon the site and request that I review his film. For the most part its me chasing filmmakers and writers, so it made for a nice change of pace. I love the above poster art, it’s reminiscent of some of Dario Argento’s work and to an even larger extent Hitchcock. The script is incredibly well written (adapted from a short story I believe) and carried equally well by an experienced cast. The film opens with some extremely well framed and meticulous camera work. It’s always on the move sometimes with a voyeuristic approach, a gentle zoom or even a tracking shot other times there’s an emphasis on certain placement of something in the scene. The lighting gave off a very neutral and harmonious vibe, use of a lot of white’s and creams. The audio levels are sharp and the intense sound effects help to convey Mattie’s paranoia as it becomes heightened with each passing moment. Every sound seems fit to provoke Mattie, an in turn the audience. The clock ticking inside the hush walls of the Whalen house, the car doors and even the scratching of a nail file/cleaner, all act as a constant reminder. The dialogue and interactions between Mattie and Olivia start naturally enough, but quickly become tense as suspicions of hostility and aggression arise. You can sympathize with Mattie if you’ve ever been in a situation where you feel like you just don’t fit, or you find yourself the odd one out. A quick glimpse into her mundane home life with care free husband Don (played by Forster), implies that she’s not a terribly happy woman and just maybe she’s started to lose her grip on reality. The final conversation dissecting the nature between Dog and Sheep ends things in the most suspenseful of ways. The writing is among the best I’ve ever seen and the entire tone is comparable to that of the great Alfred Hitchcock. I’ve been a fan of Beth Grant’s for a while, she’s appeared in films like “The Artist”, “Donnie Darko” and “No Country For Old Men” as well as shows like “Everwood” and “Jericho”. She’s got a heap of experience and draws you into the life of Mattie with ease. Sharon Lawrence from TV’s “NYPD Blue” and “One Tree Hill” is every bit as good playing the mysterious foreigner with seemingly vindictive intentions. Although his role is brief, Robert Forster from TV’s “Heroes” and “Alcatraz”, rounds out the cast nicely. Honestly I can’t say a bad thing about The Bridge Partner. I think it’s the best short film I’ve ever seen and reviewed. It looks like it was shot on a substantial budget, so that has to be taken into account given most of what I review here isn’t. The camera work and sound effects are superb, all the lighting and set design helped create the suspense and atmosphere. The performances are all top-notch and the dialogue, especially in the climax of the film is outstanding and very unsettling. My only minor issue is that it ends with a certain amount of ambiguity although normally I like that sort of thing, in this case I was hoping for it all to be wrapped up during that final shot. I suppose it creates a certain amount of debate about what the possible outcomes might have been and that’s not a bad thing. I can’t believe something this fantastic comes to us from a first time Director in Olson. I can’t wait to see what he does next and here’s hoping he sticks with the Suspense/Mystery genre, Brilliant stuff! Readers can keep an eye out for it in the near future.